Willaes, an aa cried sallaes, an osiers, form the genus Salix, aroond 400 species o deciduous trees an shrubs, foond primarily on moist siles in cauld an temperate regions o the Northren Hemisphere. 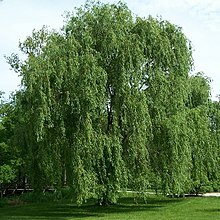 ↑ "Genus Salix (willows)". Taxonomy. UniProt. Retrieved 2010-02-04. ↑ 2.0 2.1 Mabberley, D.J. 1997. The Plant Book, Cambridge University Press #2: Cambridge.